History was made on Tuesday, January 13, 2009. It just wasn't the history that had been expected. The house gallery begin to fill by 9:30 for the "Show Down at High Noon". There was such excitement, such hope--the opportunity for hundreds of hard-working grassroots supporters who had given sacrificially of their time and resources to see the fruit of their labor and family members to cheer loved ones on. I don't think I have ever seem more people squeezed into the gallery -- patient folks who sat for over two hours to be a witness to history. At 12:08 p.m. the organizational session of the 106th General Assembly was called to order by Speaker Jimmy Naifeh (D-Covington). Rev. Maury Davis, Cornerstone Church in Madison led in prayer and Rep. Kevin Brooks (R-Chattanooga) led the Pledge. Justice Janice Holder was called on to swear in the members of the House after which the temporary rules were adopted. The next order of business was Rep. Gary Odom (D-Nashville) calling for a recess. The Republicans tried to table that motion but were unsuccessful. 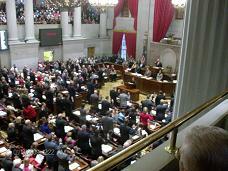 At 1:05 p.m. the house reconvened and proceeded with the election of officers. Rep. Charles Sargent (R-Franklin) said that he was honored and humbled in his heart to nominate Rep. Jason Mumpower (R-Bristol) for Speaker of the House. He noted that Jason was a very young man when he came to the house but had developed into a respected leader. Rep. Susan Lynn (R-Lebanon) provided the 'second'. Rep. Glen Casada (R-College Grove) made a motion that the nominations cease. Odom objected noting that is was improper to make a motion to close the nominations--saying that "we need to hold fair elections". Naifeh ruled Casada's motion 'out of order'. Mumpower rose to challenge the chair's ruling. A staff attorney was called in and after some discussion, Mumpower withdrew the challenge. Odom took to the podium and began his nomination. The moment he began to speak I knew he was not talking about Naifeh. He completed his presentation by nominating Republican Kent Williams (Elizabethton). Everyone (except the Democrats of course) was stunned then completely numb. The Democrats on the floor applauded while the people in the gallery booed loudly. Williams signed a pledge to vote FOR the caucus nominee. Williams promised his Republican colleagues he would vote for Mumpower as recently as MONDAY. Williams stated to the public in the newspaper that he would vote for Mumpower. Williams ran as a Republican and took money from Republican supporters who looked forward to taking the House. On Tuesday, he betrayed those promises. House Clerk called the roll -- Democrats first. Each one voted, "Williams". Each Republican in turn cast their vote for "Mumpower". Williams was the last to vote and voted for himself, thereby sealing the 'deal', 50 votes for Williams, 49 votes for Mumpower. On November 4, 2008, the people of Tennessee voted for a new, conservative direction. On Tuesday, the voters of Tennessee were betrayed. The entire floor session can be seen here. You CAN see highlights here!! 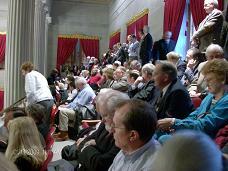 Tuesday's Senate floor session is posted on the General Assembly website too. An interesting note on the Senate floor activities: When Lt. Governor Ron Ramsey was nominated for Speaker and Lt. Governor, Sen. Doug Henry (D-Nashville) rose to 'second' the nomination, but then stated is intention to vote for the Democrat nominee, Sen. Jim Kyle, Memphis. The next order of business was the election of Speaker Pro Tem. Rep. Johnny Shaw (D-Bolivar) rose to nominate Rep. Lois DeBerry (D-Memphis). The Republicans ask for and received permission for a recess to review their options. When they returned about thirty minutes later, Rep. Harry Brooks (R-Knoxville) rose to nominate Rep. Beth Harwell (R-Nashville). When the roll was called, all the Democrats and Williams voted for DeBerry and the 49 Republicans voted for Harwell. I don't agree with DeBerry on much, but in her acceptance speech, she said, "you can't make this stuff up." You sure can't. Democrats who CLAIM to be pro-life voted for Rep. Lois DeBerry for Speaker Pro Tem have a LOT of explaining to do. She is a leader in the group who consistently leads the opposition to defeat the amendment (SJR 127) that would neutralize our state Constitution on the issue of abortion. Toward the merciful end of the floor session, Rep. Mark Maddox (D-Dresden) rose to ask for a moment of silence for the wife of Rep. Les Winningham (D-Hunstville) who was said to be 'at death's door'. Interesting -- he left her bedside to be on the floor. The hurt and disappointment etched into the faces of both the Republican legislators, their staff members, and all their supporters was painful to see. Everyone was blindsided--it felt like taking a hard punch in the stomach -- it just left you breathless. From what I can determine, this deception was spearheaded by Rep. Gary Odom (D-Nashville) who reportedly visited with Williams over the Thanksgiving holiday to present the plan. Evidently, Speaker Naifeh held out hope until Monday that he could be re-elected to the position in his own right. When it became clear that he could not, the "Williams" plan went forward. Williams was 'prepared' with a Bible to take the oath on and a written acceptance speech. The scriptures below have been the basis of the call on my life since the late 1970s. They are very appropriate for this time and place. Please be assured that we will continue to work diligently for the families of Tennessee, regardless of the make up of the Tennessee General Assembly.